As I was watching the Super Bowl yesterday I saw this advert on TV about a fun and completely free app. The makers of Brisk Iced tea and Lucasfilm have joined forces to bring you Brisksaber. 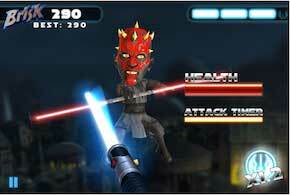 A game within which you will be able to easily use the tip your index as a lightsaber in order to conquer space as a Jedi (good guy) or a Sith (bad guy). This game is pretty entertaining, easy to use and well designed. This Brisksaber app is totally free and can be used on both iOS (Apple) and Android systems. So, if you have a little bit of spare time on your hands or your kid loves this kind of game, this one simply cannot be overseen. Beware though, since this game can be quite addictive. Personally, I’m not much of a gamer, but I have to admit of being a bit of a closet Star wars fan. Plus, I’m a bit of a sucker for this type of entertainment.